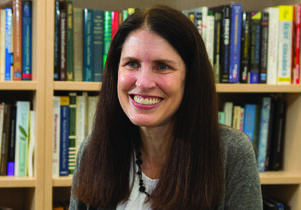 Kathleen McGarry, professor of economics at UCLA, has been elected to the national senate for Phi Beta Kappa, a national academic honor society. McGarry’s research focuses on the well-being of the elderly and the transfer of resources within families. She has studied the long term care, health and life insurance markets, as well as the role played by families in providing insurance for their least well-off members. McGarry’s current work analyzes the importance of end of life medical expenses, particularly expenses associated with nursing homes and home health care, and differences in spending by disability status. Founded in 1776, Phi Beta Kappa has chapters at 286 colleges and universities in the United States, nearly 50 alumni associations and more than half a million members worldwide. Noteworthy members include 17 U.S. presidents, 40 U.S. Supreme Court justices and more than 140 Nobel Laureates. The mission of Phi Beta Kappa is to champion education in the liberal arts and sciences, foster freedom of thought and recognize academic excellence.